For probably the entire 16 years of their married life from 1885, William & Hannah lived in the Southam Street district of Kensington and Hannah continued to do so right up until her death in 1959. It is fascinating to see how the area changed significantly over the years and how it went from rural to slum in roughly 50 years. They lived slightly to the west of Westbourne Green between the Grand Junction Canal to the north and The Great Western Railway line which was immediately to their south. 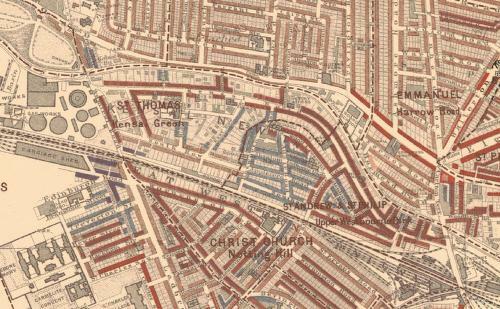 Back in 1827 (Greenwoods Map) Westbourne Green was exactly that – green. A few manor houses and fields lay just to the south of the Grand Union Canal. The Great Western Railway line between London and Bristol was fully completed in 1841. There were a few additional streets built by 1859 (Reynolds) and the area is then described as “Kensal New Town”. An 1871 map (Whitbreads) shows a few more streets having been built with Southam Street then being named “South Row”, as opposed to three other adjacent streets inventively called West Row, Middle Row and East Row ! There weren’t many changes up to the 1877 (Stanfords) Parish Boundaries map. Click here for a good map of Southam Street and the surrounding area as it was and here for a map of Southam Street and St Ervans Road as they are today near the Trellick Tower. Southam Street – 3 ½ story - labourers, navies, not railway employees but in the building trade. Have to follow their work and go away by train in the morning. The women do laundry work either in South Row in Kensal New Town or go north to the laundries in Bretheron & Harris streets (?). There is a great deal of dark blue in this street although the east end is fairly good and purple to pink. The whole street should be light blue. It was to this place that Fowler & Milsom, the Muswell Hill murderers, decamped with their plunder. They escaped notice getting here because they came all the way by the Willesden Fields. Edenham Street – 3 ½ story - Like Southam Street but nothing in it is so bad looking as the worst in Southam Street, but poor. Light blue to purple. Treverton Street – 3 ½ story - Doors open. Bird cages outside windows. Many windows broken, but much better than formerly. Some pink. Light blue on map. At the east end is the “Holly Bush” to all appearances a public house but only on draught because for wine, beer & spirits “applies every year for a full license but it is always refused”. Talbot Grove – a rough poor class of hawkers houses at west end on south side very rough and bad. Horse keepers & casters. Light blue. Edinburgh Road – 3 ½ story – very poor looking. Loads of women leaning out of most windows to discuss our business. Window frames broken, dirty, patched up with boards, cardboard & brown paper as well as bedding. Mission Room on the north side belonging to LCM. Road unmade, muddy, messy. Leads directly to Wormwood scrubs by way of carpet beating grounds. Men work on the railway as carriage workers, as navies & caters & builders labourers. Houses held in one or two bedroom tenements, rents 2/6d or 3/6d for single rooms. Not vicious, very poor, rough, low. Not a great deal of trouble, some drink, not many of the men depend on the earnings of the women in the laundry. The broken windows due more to childs play from outside than to internal squabbles. Suffer much in hard weather but have had no out of work this year from that cause. Light blue. Cirencester Street – the worst of the lot - 3 ½ story –improves like the rest of them towards the East end. Rough customers. Some thieves. A good many prostitutes but no brothels. Not enough vice to give a line of black to the street. We only suspect the prostitutes. They ply their trade track in the parks. There is a mews on the south side of the west end with only one cab proprietor living over his cabs. Not marked nor worth marking. Ransleigh Hall also on the south side is a mission in connection with the parish church. Does much good, feeds the children. Inhabitants all of the working class whose profession and practice is work but who are out of work for long spells. They pay their rents. They turn them out very quickly if they don’t. Character light blue to blue. St Ervans Road - 3 ½ story – some poor at North End. (can’t read) footbridge at the south end leading across railway to Tavistock Crescent. Pink to purple.